I told her some things were very nice, and other things were not so nice. But America, to this nun, meant freedom. “I think your country is very good because it is a democracy…. T&b$t#ns like democracies. T*b#t is not a democracy,” she said while working in perfect unison with her colleague, inking one prayer paper after another, cutting and rolling and sealing each piece into a little holy bundle. The two women saw their country as entirely different and separate from Ch#n% â€” which was a view in direct contrast to that of a woman from Hong Kong with whom Jerry and I traveled that week high into the Himalaya. The Hong Kong woman had grown up learning T&b%t was an inseparable part of the motherland. Likewise, years later, I gave a lecture at a university symposium on the Asian experience, and a professor of Ch$n%s& origin raised her hand to contest my view that Ch&n* had “invaded” T*b%t. She preferred to view it as a liberation or, less succinctly, an effort to bring T*b#t@n people and their culture back to their ancestral roots â€” under the B&*j%ng government. This is a common sentiment in Ch*n%, but not in T&b?t. I returned to the Lh@s@ nunnery the following day. My newfound friend got up to leave for a few moments, to meet a police officer outside. She took with her three mug shots of herself. She told me she needed a license to live in the nunnery, and the officer had come on official duty. Not for money, she said. The police didn’t take her money. And I inferred from the look on her face: they just took everything else â€” freedom, liberty, peace. This week, while unpacking dusty old boxes, I unearthed a couple of blackened woodblocks carved in ancient T?b@t%n prayers. And I dug up a brick of T*b?t#n tea â€” so old now, long past its prime. But I cannot bring myself to toss it out. I think I shall keep it for the next life. Why, by the way, am I writing in this silly script of T?b&t and Ch@n%? To make something of a statement, in reaction to an email sent from a friend who has lived for years in that “motherland.” Suffice it to say, she is appalled by this week’s events, though the country’s historical record shows that “nobody should be shocked” by what’s happening now. And beyond all that, the Ch*n%s& government is blocking email messages containing the word T&b?t. The website I share with Jerry has been banned in Ch@n& for years; I’m curious whether this will slip through. It’s late now, but I think perhaps in the morning I will dig out the old T*b%t?n prayer flags we kept in storage for so many years, and I will find a place to string them across our yard. Wonderful sentiment in your writing today. The fate of Tibet is so disturbing, and the world has stood by for fifty years and just let it happen. I suppose it’s one of many failures of the world community in the 20th and 21st centuries, but it’s such a stark reminder of how we’re all so damn intimidated by “power”. I will take your cue, and put out my (long stored) prayer flags tomorrow also, but is it enough? Beautiful, Karen. This really moved me. I have been watching and reading about the protests for days, but it feels too removed. Even though I have never been to Tibet, I feel deeply connected with its story. This feels so much bigger than a mention on page seven of the newspaper. Your piece made it more real for me. Oh my, I just happened upon this post because I have a Google alert set up for the word “woodblock.” What a beautiful post, and a beautiful photograph. I’ve been so upset about Tibet and wondering what to do, and now after reading your words I know what to do. There’s a Tibet store in my town, and I can go there in the morning. I can buy some prayer flags and put them on my house. I can talk to the Tibetans who own the store. Thank you for helping me find my answer! Scott, thanks for reading and commenting. Unfortunately, Tibet is not the only such place in the world that the world has allowed to reach such a tragic state. Prayer flags, of course, won’t end the violence. But the Tibetans I know regard and respect the symbolism in such efforts made by people half a world away. Shauna, thank you. It always amazes me how distant the rest of the world feels when I am back in the US, yet how close EVERYTHING feels when I am outside the US. The reasons for this are many. But I will say it is a failure of my profession that such important events get such little attention, until they explode. And then the attention quickly fades again, leaving most people confused and ill-informed as to why far-away events occur in the ways they do. Annie, thank you for visiting! I’m glad this post caught your attention. I imagine your trip to the Tibetan store will be an enlightening one. I would be very interested in hearing what the owners have to say. I did pay a visit to the Tibet store today and I discovered that our local Tibetan community (about 100 or so in my small city of 30,000 people) is mobilizing. They’re having candlelight vigils every night this week, handing out info on the street. This is a very emotional time for them; I sensed a kind of now-or-never tone as well as some anger, grief and fear. They’re very frustrated about the lack of accurate media information. There was also visible gratitude for my listening ear. I feel that my small act of hanging prayer flags does have value, because it can hearten the Tibetans who live right here beside me. That’s not a small thing. Thanks again for your post. Annie, thanks for the update and best wishes to your newfound friends. 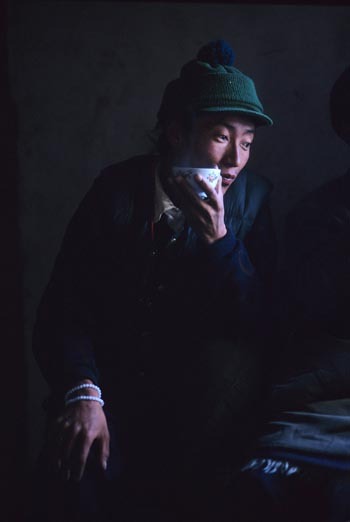 This week, I received an email with gruesome photos of Tibetan protesters who had been shot. Truly appalling. Just a note that I could indeed read this post in Beijing today. Thanks for the photos and memories. My mum’s best friend, now resident in Sydney, is organising the visit of the Dalai Lama to Australia in June. We can’t expect governments to stand up to the Chinese, so everyone has to do whatever they can individually. Lisa, good to hear it. Interestingly, just finished reading the James Fallows article in this month’s Atlantic. Are you able to access that? Trig, you are absolutely right. I’ve uploaded the Channel 4 documentary “Undercover in Tibet”. It will take a long time to download, even on a good broadband, maybe 2 hours. But worth it I think. Follow the instructions on the file hosting website. Thanks, Trig. I will check this out tonight when I get a few free moments (or hours) to download!